Experiences of the numinous 'visions of the divine' in dreams offer glimpses into a vast well of teachings available to us beyond the boundaries of our waking consciousness. In this investigation, numena are understood as harbingers that awaken deep ways of knowing and perceiving; they enliven and inspire appreciation for the sublime wonders and textures of life. This work represents one woman's account of her dreams drawn from over ten years of journal entries. The numena for discussion include: the "Spirit of Sound," the "Mother," and the "Skywoman." These mythologems are examined through the portals of Clarity dreams, Personal Mythology dreams and Initiation dreams. The author's objective is not to present an interpretation of the dreams but to examine the mytho-religious symbolic content and mystical qualities of the dream experience in order to understand them as guiding forces for furthering spiritual development and human potential. This book is a rare account of primary research on this topic and will appeal to those interested in dream work, spirituality, women's studies, psychology, shamanism and consciousness studies. The Surrealists suggested that it would be interesting to consider the continuum of our dreams as the foregrounded narrative of our life--punctuated by moments of awakening from sleep as simply moments of interruption of the dream life continuum--the reverse of the way we think of these states now. 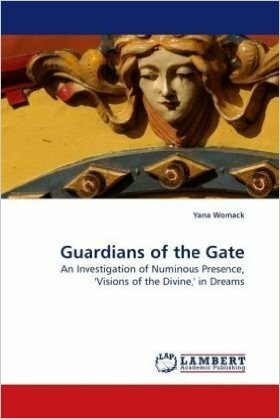 Yana Womack Castle in "GUARDIANS OF THE GATE: An Investigation of Numinous Presence, 'Visions of the Divine' in Dreams" created the narrative of her life from the perspective of dream experiences spanning over a decade in which she encountered deities and numinous presences in various forms. In her numinous dreams, Yana received teachings and empowerments from Buddhist masters, yoginis, medicine women and shamans through methods of energetic transmissions and other means often accompanied by states of profound ecstatic bliss. She also interacted with lions, deer, snakes, flowers, and ocean waves, flew above the clouds, met with guardians and shapeshifters and traveled to places inside the earth to receive counsel and healing from her allies. The framework of this extraordinary work in which eventually the dream world and the waking world interpenetrate is organized according to three phases: Immersion, Amplification, and Engagement. This unique process enabled Yana to encounter the numinous presences, amplify their interpretation by exploring their archetypal symbolism, and finally, engage with them through ritual and ceremony in order to integrate one world of reality with another. The result of this ambitious and extremely accomplished project is that through the dream gifts, Yana was able to acquire knowledge of the deepest parts of the psyche in its relationship to the entire cosmos enabling her to recognize her origins, her soul's true path and her passion and purpose in this lifetime. As a revised iteration of her doctoral dissertation, Yana Womack Castle has expanded the contours of what research consists of in relation to self-inquiry, personal growth and the sacred. She follows the dictum that the journey towards multidimensional knowledge on a personal and interpersonal level is a spiritual journey, even when it fulfills the requirements of an academic degree. I was personally moved that she expressed this so clearly, as I have always known people who felt this way, and were, perhaps, too uncomfortable to speak of their research in these terms. Her work is multidisciplinary as well as multidimensional. She has chosen to engage with the power of Sound--sounds she primarily encountered in her dreams, with the Great Mother and the many mothers relating to the dream gift she received of a Matrioshka Russian nesting doll, and her engagement with Skywomen from various cultures and traditions ranging from the Bird Women of Lithuania to shamans and dakinis. Through exploration of her numinous dreams, Yana was able to recover ancient knowledge to fill in the lost and forgotten wisdom of her heritage, making it clear that pilgrimages, rituals, meditations, visions, and dreams bring forms of awareness that we may not ordinarily have access to. This is a most inspiring and educational work, as well as an outstanding form of spiritual autobiography.Ultimately, Yana realized that she had been experiencing a parallel life in which she could cross over between the worlds and expand her knowledge of how to access the numinous presence of divinity in both worlds. Working with the numinous 'guardians of the gate' is consciousness expanding. When our capacities of learning are extended to include teachings provided in both waking and in dreaming states, we are offered a wider vista to the many faceted gifts life has to offer. In my estimation this process is a true Vision Quest, partly shamanic and partly scholarly because all these paths are valid journeys towards sites of revelation, transmission, and initiation. They are portals to expanding our consciousness towards the acquisition of a fuller awareness of our multidimensional place in sacred reality. By declaring that the realms of the numena are REAL, Yana has opened a potent pathway towards nurturing and expanding the evolution of our consciousness. I recommend this book to all who have not yet made this extraordinary journey and seek to encounter the presences in the domains we call invisible. Now that we are made aware aware of the possibility of experiencing this kind of awakening, we may follow the path delineated by Yana Womack Castle's impressive Search and Re-Search, and expand our consciousness and life experiences as we profoundly interact with visitations of the Numena from the multiple realms of the Real. This book is a unique and compelling combination of personal revelation and academic analysis of shamanistic style dreams experienced by the author, including a fascinating resource compendium of lucid dreams. Collected over a decade, these dreams are healing, ecstatic, mystically transcending, initiatory and visionary for Womack. In these dreams she's given gifts which are transmissions of guidance. I found her writing both clear and inspired, bringing me into these dream experiences as well. Though this volume is expensive, because of its considerable content and innovative approach it is well worth the price. The text is an adaptation of her PhD dissertation when she utilized organic inquiry, a method of academic exploration that combines personal reflection with more traditional research and investigation methods. Womack ties her dream content into insights from numerous publications originating in a variety of academic disciplines. What she produces using this approach is a rich and provocative synthesis of personal experience with mythology, religion, folklore, shamanism and women's roles as healers in pre-Christian Europe. This approach has produced a narrative that is relevant to the events and feelings in my life and many other women I have known, thus making it all the more valuable and worth engaging. While this book is chock full of information, its outstanding strength is its personal voice and authenticity. Womack reveals key aspects of her personal history to bring forth incredibly poignant images. She then ties them to mythology and religious traditions, notably the Tibetan Buddhist tradition which has been her own personal spiritual path since her adolescence. For example, she asks that Tara grant her permission to speak of "my sacred dreams so that others may benefit from this path of inquiry." In addition to her description of her dream work, Womack's alludes to her academic inquiries and personal interest which lead her to India and Nepal. She recalls these in sensuous detail, reflecting on how these environments contrast to her American life, both aesthetically and spiritually. She sees these contrasts as a catalyst for deepening her personal inner life helping her maintain a spiritual connection with the unseen forces she has always sensed. These accounts are valuable in themselves, both to those who make frequent pilgrimages to Asia and those, like me, who are arm chair travelers adept at benefiting from good story telling, which Womack skillfully provides in this book. Keeping a connection with the sacred in my own life is supported by her stories even though they are experientially very different from my own. Womack also feels that her personal ancestry is important to understanding her own spiritual inclinations so she includes them in her study. Her family lineage extends into Eastern Europe and Russia, with which she feels a deep resonance. A particularly captivating section covers the author's journey to Russia and her dream about a mother doll. She meets this mother numena in her diverse roles as wisdom guide, the earth, and grandmother. She feels this dream and the mother doll create a mythic thread to her own ancestral roots as well as provide insight into some Eastern European spiritual and folklore practices. I found this most interesting because of my own roots in Eastern Europe. I think many people with mixed lineages would find this book extremely helpful in appreciating the ways ancestral roots play an influential role in our personal lives even in secularized westernized societies. In another section, the shamanistic phenomenon of shapeshifting is explored in relation to "skywoman," a woman of wisdom who transcends the boundaries of space and time. Womack states: "The jana in my dreams, I feel, is my double, my guardian. She is the one who speaks to me through intuitions, feelings, and dreams. I understand now, I have been supported by a pantheon of numinous presences. They have always been there to provide me with a wider vision of experience and a sanctuary of love." Finally, Womack does not write this book for the already educated, but provides definitions that helped me to understand this material and incorporate it in my own spiritual journeying. For example she uses the word numinous frequently, defining it as "a deity, spiritual entity, angel, and hierophant among others which can manifest as an invisible force or presence such as a wave or shimmering light." I highly recommend this book. In addition to its intellectual content which will support academic inquiry into dreams and cross-cultural spiritual practices, reading about Womack's vivid and well analyzed dreams has enlarged my appreciation for my own direct experiences of numinous entities.